Take amazing pics & watch live video with the thunderbolt wifi fpv drone with camera: capture intense hd pics and video from an incredible aerial perspective. Wifi transmission allows you to instantly sync your flight to your phone and watch in real time. The ultimate beginner drone with app control, headless mode & flight plan: this camera drone is super easy to control with just the tilt of your phone. Headless mode means you’ll never have to adjust the position of the drone and flight plan makes it simple to map out and execute your desired flight path. Enjoy precision & stability with altitude hold: enter hover mode to help steady your flight and stabilize aerial photos and video. Ultra bright, flashing led lights let you fly even at night: this led drone can be flown any time of day. Bright led lights make it easy to spot even in a night sky. Perform cool, 360º flips & stunts: impress your friends and family with this powerful, stunt drone. With just the push of a button, swoop through the sky while doing awesome tricks. A light wind will take the drone from you unless you use advanced mode. I contacted the company after I lost mine and they gave me a new drone. Great customer service, but I STRONGLY recommended a warning label on the box. Hope they follow through because watching your new drone fly away is not fun. Thank you for your review and we appreciate your suggestion. We took note of it and will definitely forward it to the manufacturer for future improvement. We’re a small company from Seattle that primarily operates on Amazon, so experiences like this are a big deal. If you have a couple minutes, spread the word far and wide by writing a product review for our X5UW Thunderbolt Drone on Amazon! Here’s the link: https://www.amazon.com/review/review-your-purchases?_encoding=UTF8&channel=YACC&ref_=ya_review_purchases# Again, thanks for sharing. We’re all smiles over here! Dislikes; having difficulty getting headless mode to work. Thanks for dropping by and posting your review. I see that you are having a problem activating your headless mode. Turn to page 18 for the steps on how to activate your headless mode. The model of the drone is different but the concept is the same. 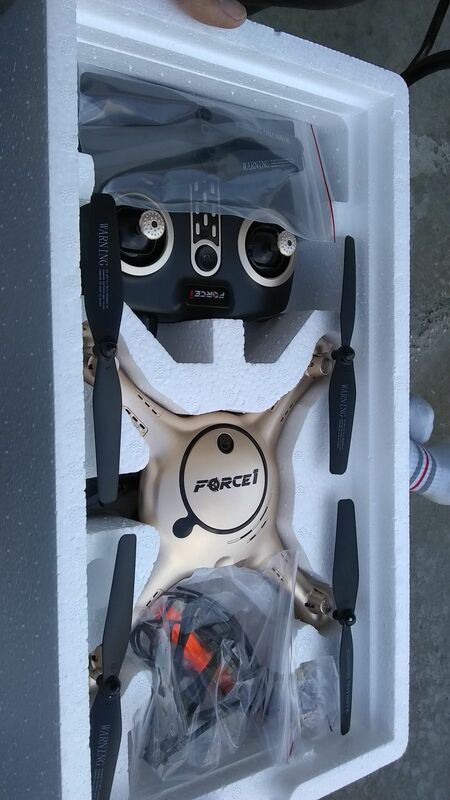 I am really happy with my new toy , I like the altitude hold mode included in this drone , the camera has a good resolution , I will recommend this product to futures customer's and friends. We’ve all got an extra hop in our step after reading your review on our site! Thanks for sharing your experience with us – we love knowing we’re on the right track with our customers! We’re a small company from Seattle that primarily operates on Amazon, so experiences like this are a big deal. If you have a couple minutes, spread the word far and wide by writing a product review for our X5UW Thunderbolt Wi-Fi FPV Drone on Amazon! Here’s the link: https://www.amazon.com/review/review-your-purchases?_encoding=UTF8&channel=YACC&ref_=ya_review_purchases# Again, thanks for sharing. We’re all smiles over here! Joe N. Reviewed by Joe N.